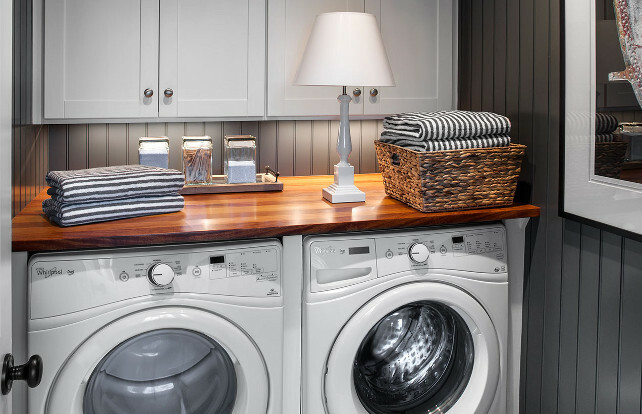 As soon HGTV reveals their new house each year, many blogs, newspapers and any kind of media often shares pictures and some decor details about this popular home. 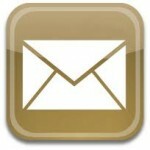 Today, I went the extra mile and collected all the information I could find to share with you here! 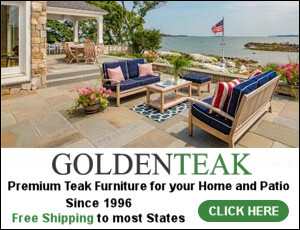 You will not only see the new HGTV 2015 Dream House pictures, but you will get to know the paint color of each room, the furniture, decor and other important details. 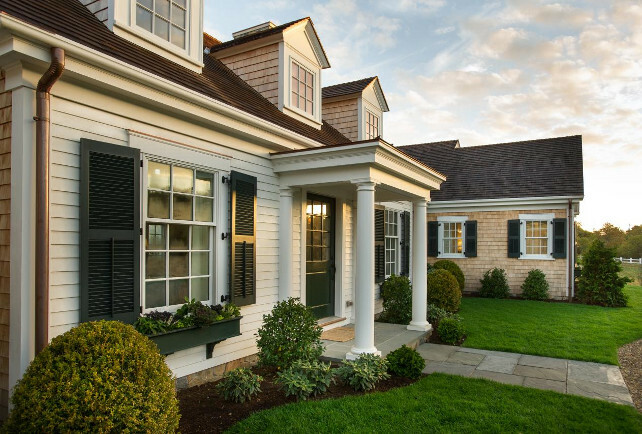 Located in Edgartown, one of the most charming towns on Martha’s Vineyard, and designed by one of my favorites architects, Patrick Ahearn, with interiors by Linda Woodrum, this classic cape cod is as good as it gets! Find out all the details under each photo. I know you will love this home! 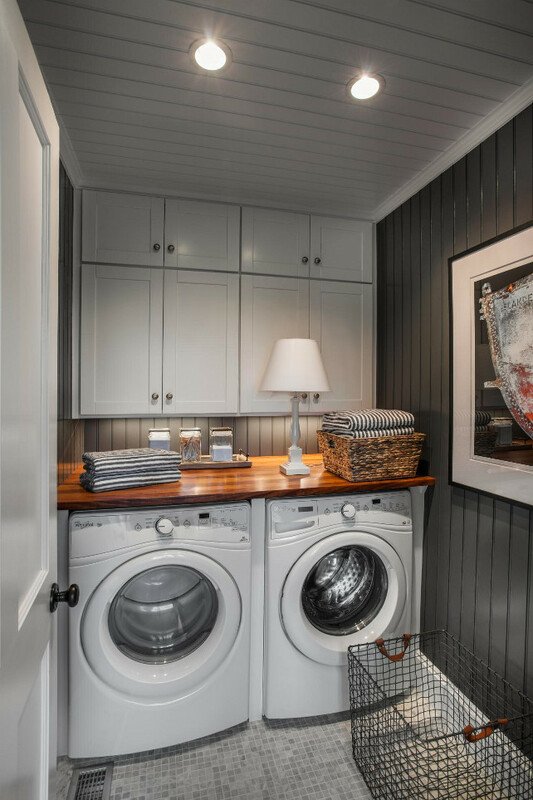 This house is 100% my style… not more, nor less. I could simply move right in! 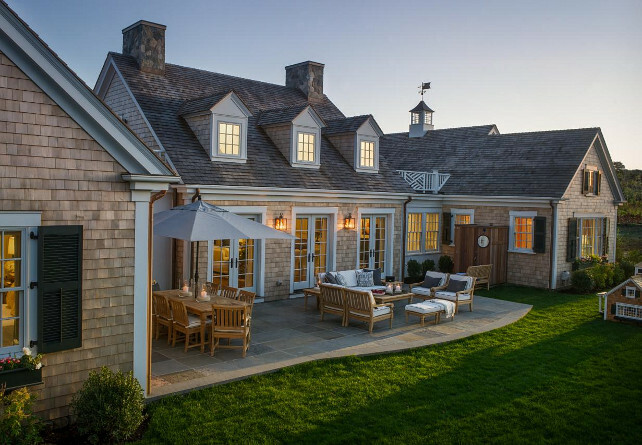 The architect was very careful to pay close attention to Cape Cod style and details when choosing every aspect of this home. 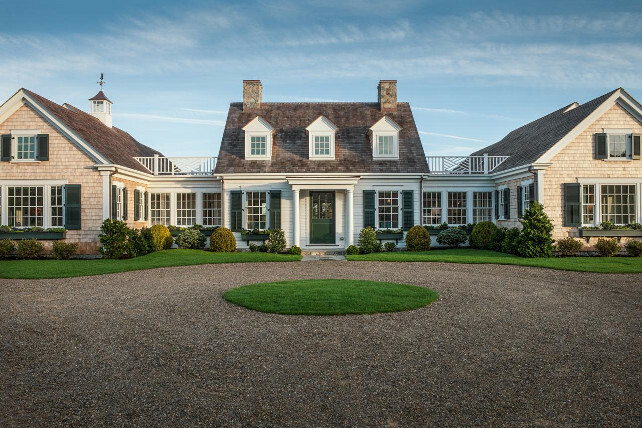 Rather than a paved driveway, a traditional pea-gravel drive adds to the home’s New England style. 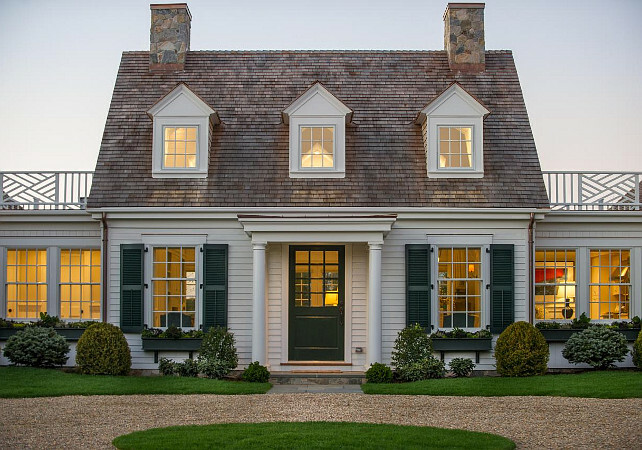 The house blends cottage-y charm with traditional architecture. 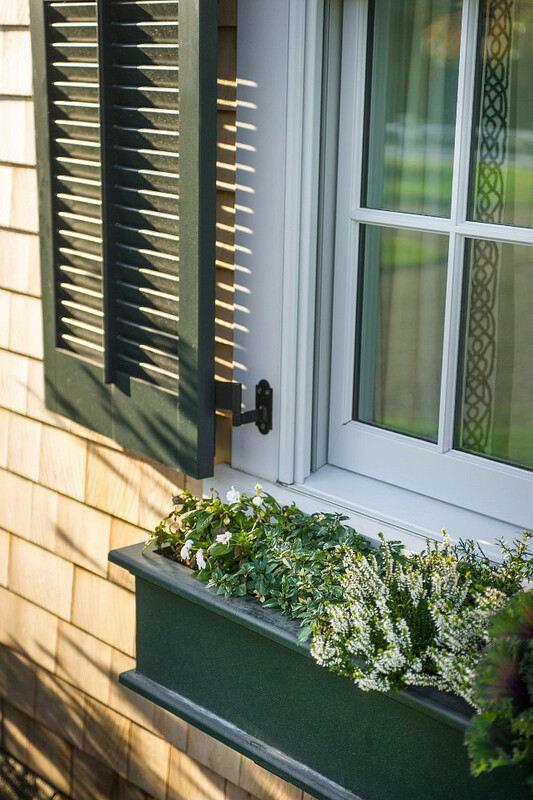 Window-boxes add charm to the exterior of this home. 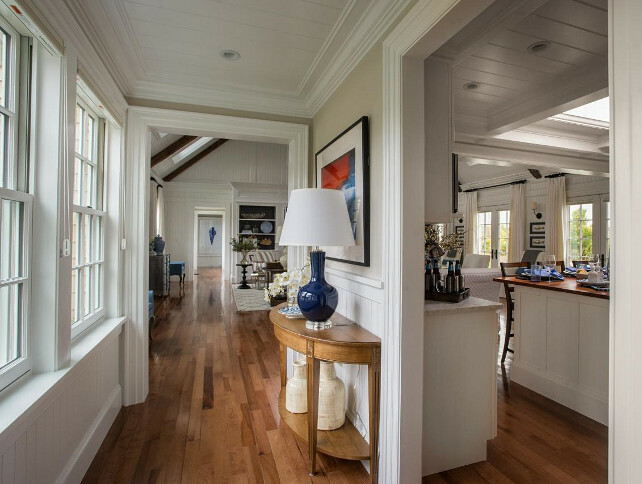 The foyer is open to the the grand room, making of this entire space perfect for entertaining. 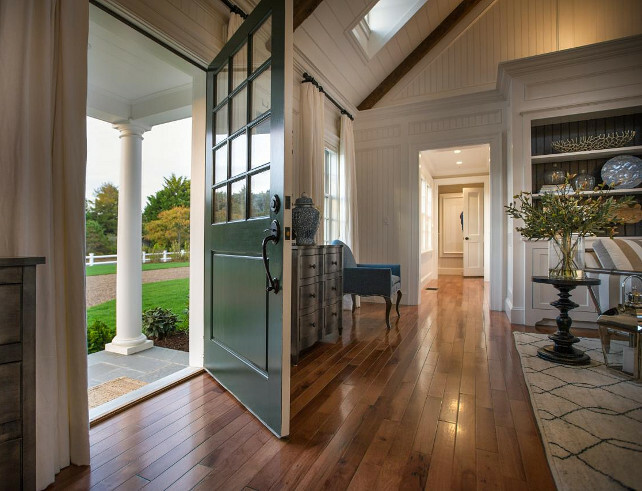 According to the designer, the two large paintings on either side of the front door were sourced locally — much of the art in the house is local. 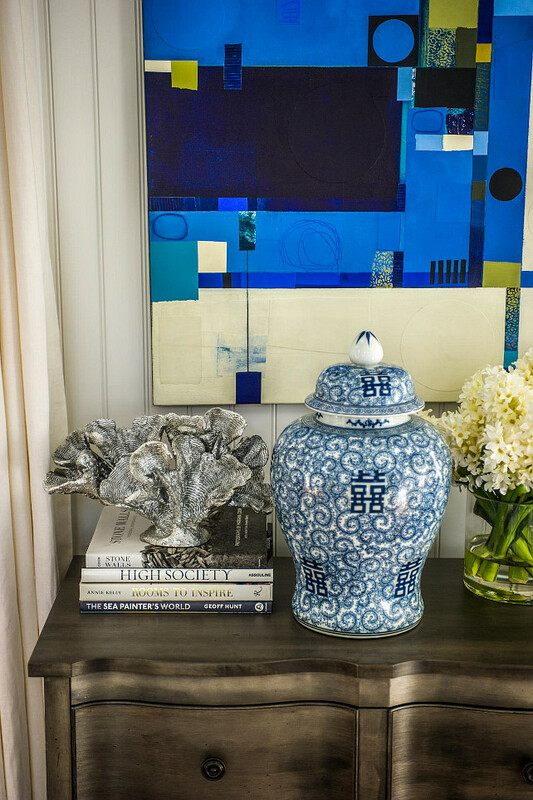 Jar is the “Blue and White Temple Jar” from Ethan Allen. Floors are “Casa de Colour 3/4″ x 3-1/4″ Walnut Hickory”. 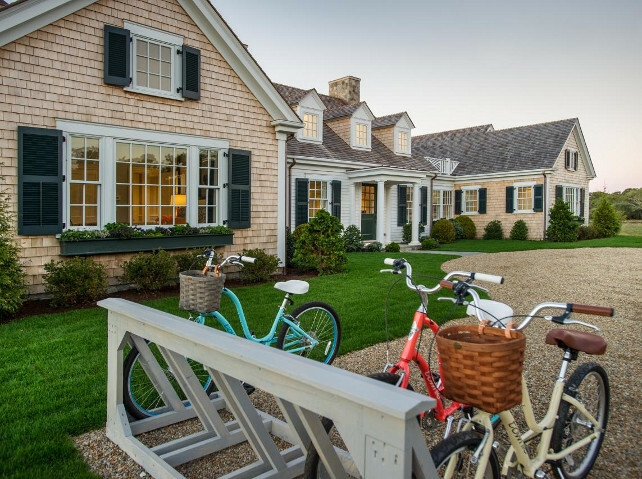 This home makes use of classic architectural elements, such as beadboard and traditional wood flooring. Coffee table is the “Beam Small Coffee Table, Portabello” from Ethan Allen. The bookcase is painted in “Sherwin Williams SW7674 Peppercorn”. Rug is the Tulu Trellis Rug, Natural/Black, from Ethan Allen. 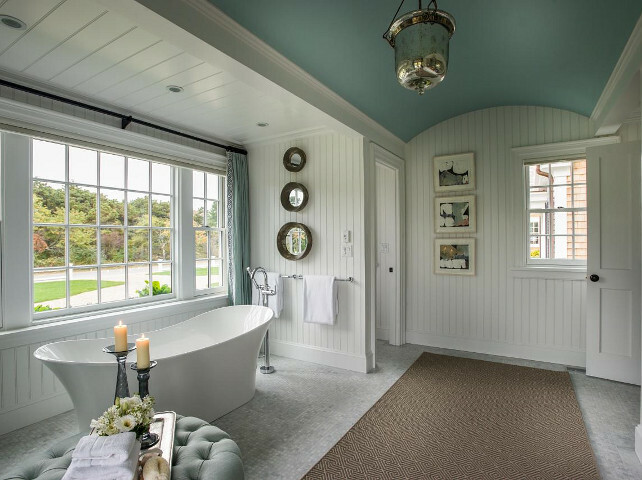 The entire space is painted in “Sherwin Williams SW 7005 Pure White”. 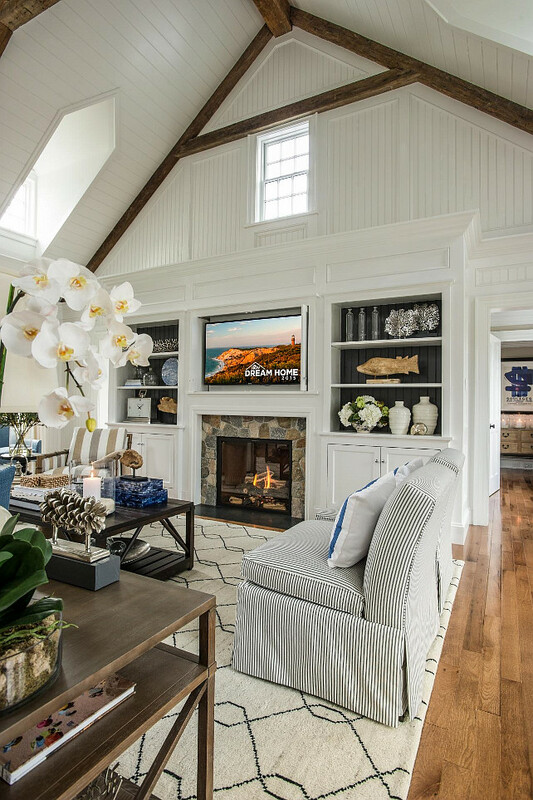 Notice the clerestory window above the fireplace. 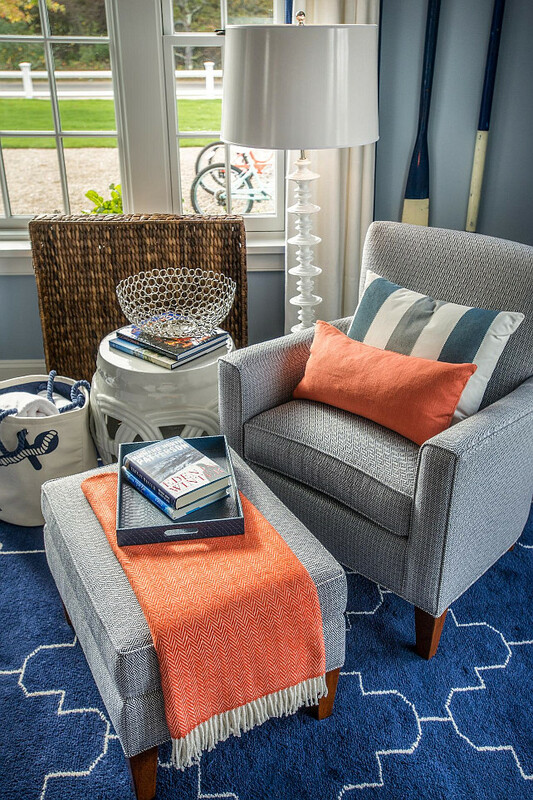 Many of the furniture was upholstered in Sunbrella fabric for its durability. 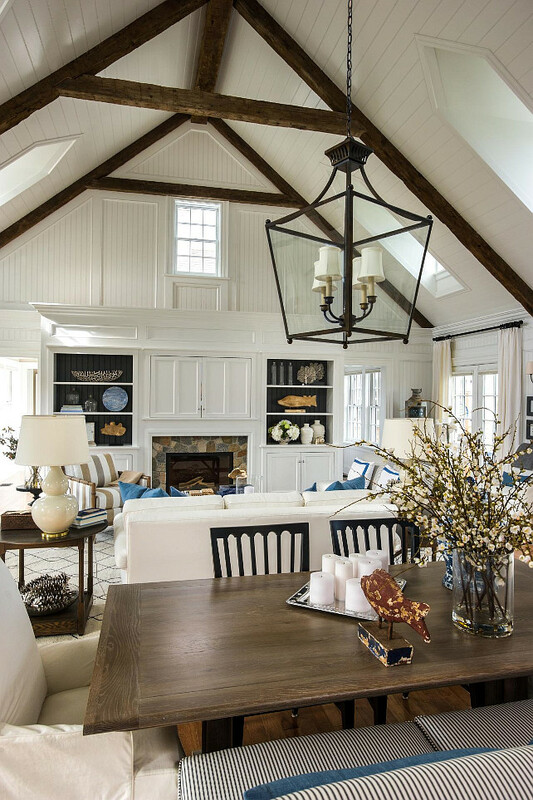 The two-story high ceiling contributes to the room’s open, airy design. 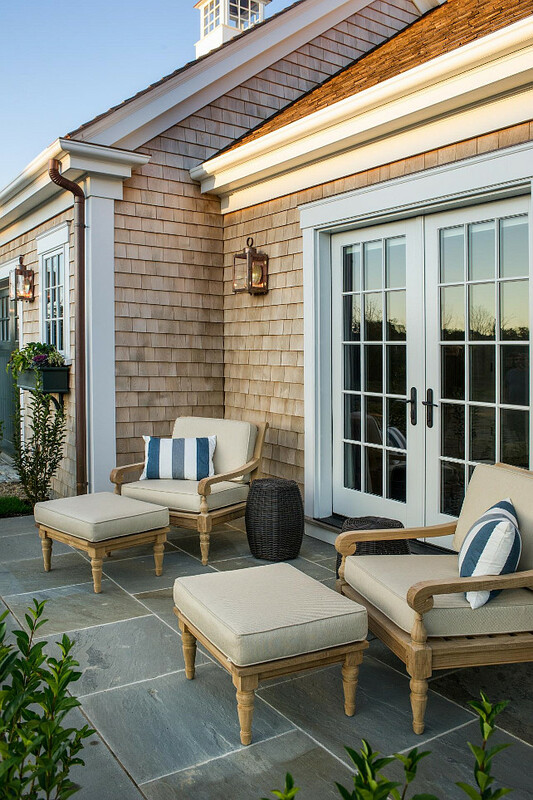 Two pairs of French doors open up to the patio outside, a space that offers even more seating and acts as an extension of the family room. 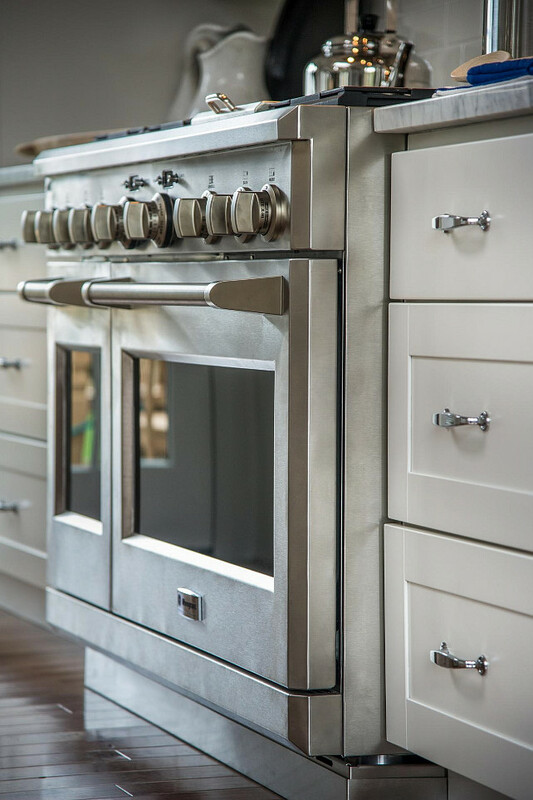 Classic and timeless details are found everywhere in this home. 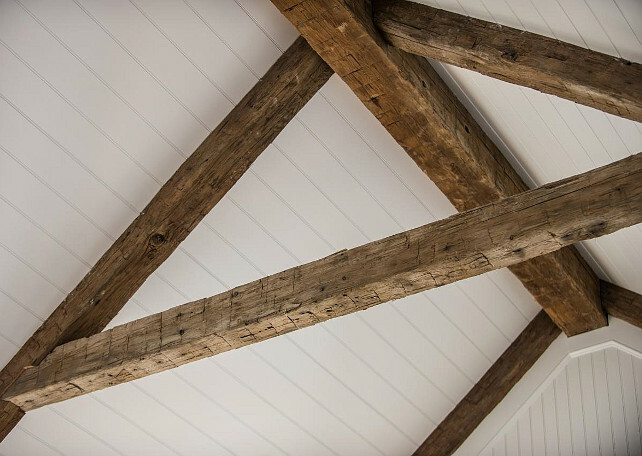 Reclaimed vaulted beams bring a rustic charm to the family room. 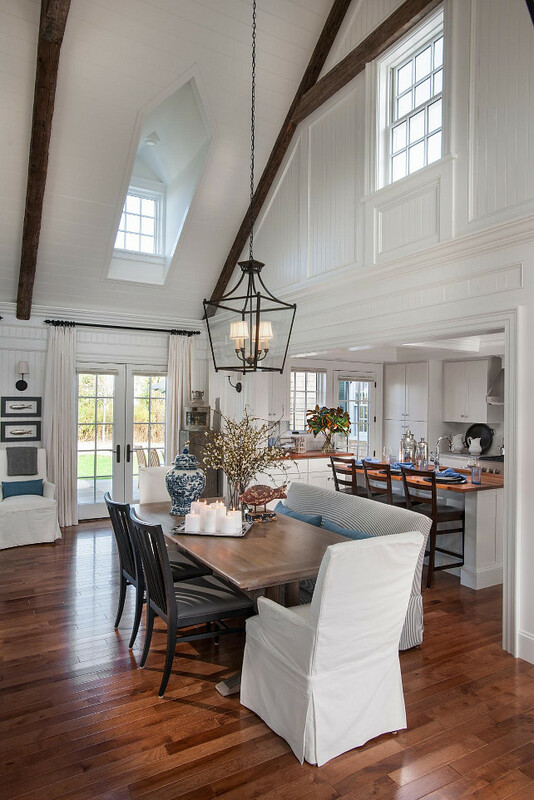 The dining room is a bright, open area with stylish mixed seating and classic cottage charm. 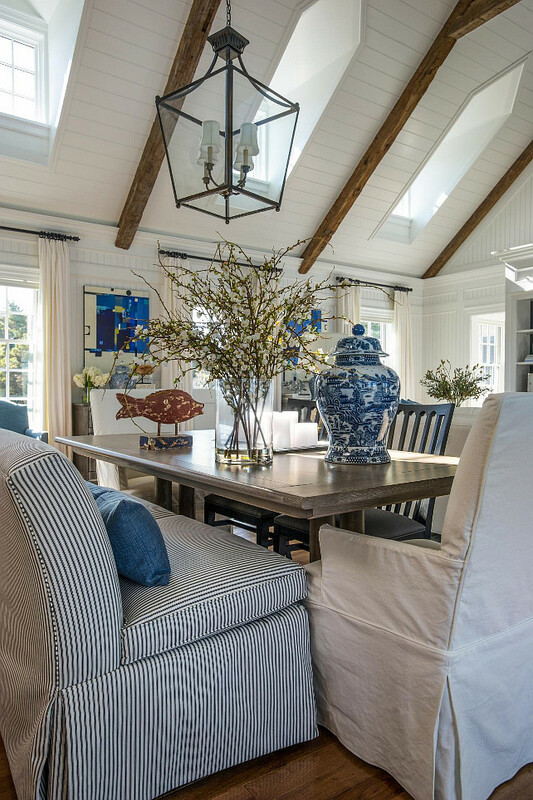 The dining room seating (all from Ethan Allen) was given a mix-and-match approach in order to keep the space from feeling too stiff. 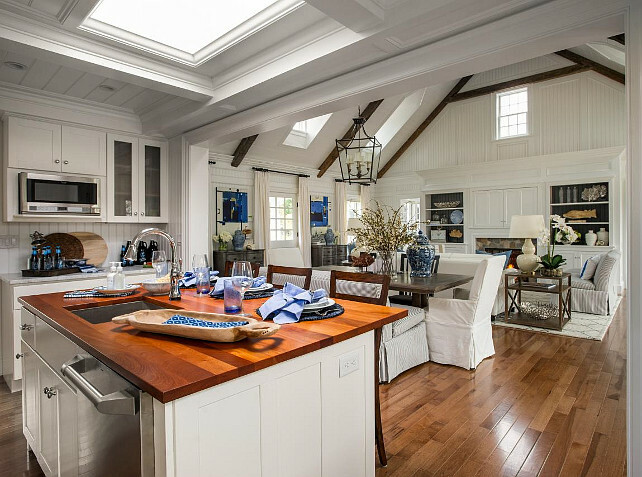 The open kitchen leads straight to the dining room, making the entire home feel bright and airy. 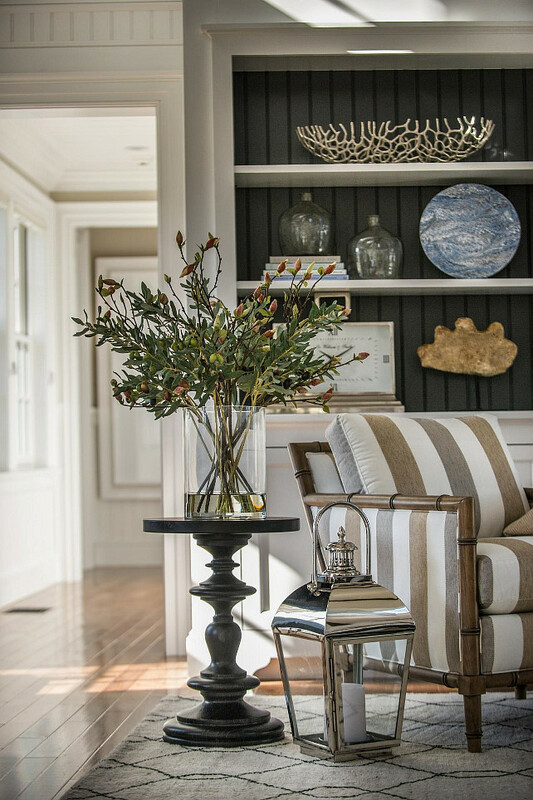 Lighting is the “Stockton Bronze Lantern” from Ethan Allen. 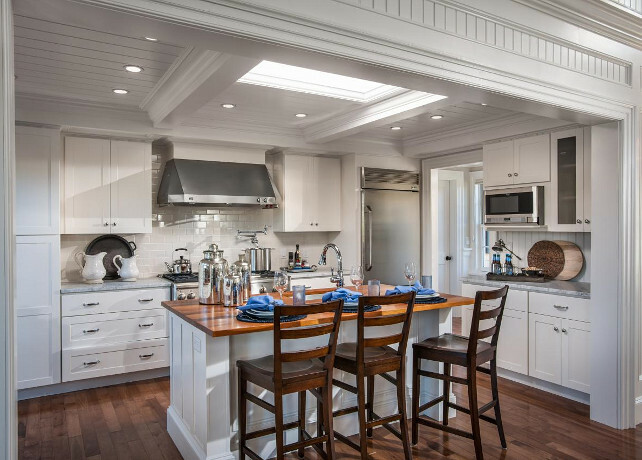 A kitchen with open layout makes it easier for entertaining and family living. I love the flow this home has. 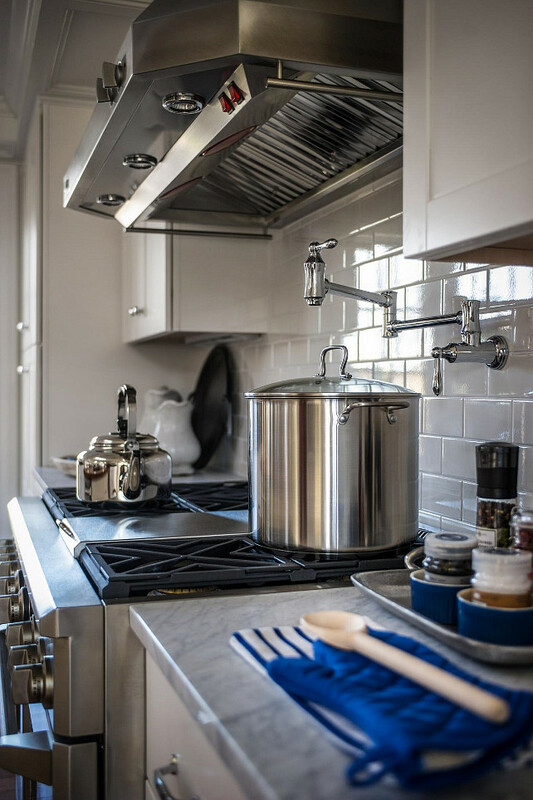 This small kitchen is all about the detailing and the trim. 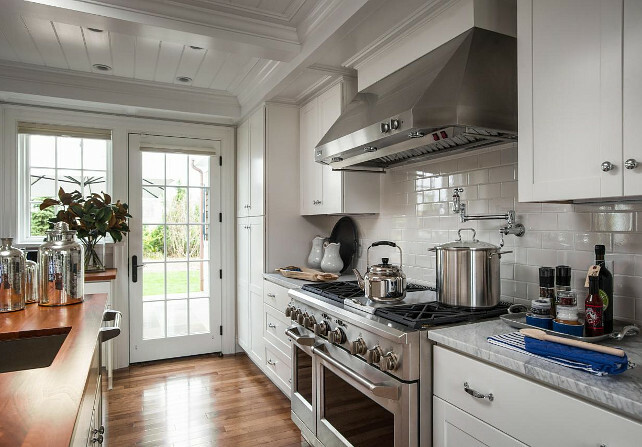 Cabinets Paint Color is “Sherwin-Williams Pure White” _ a great white for crisp white kitchens. 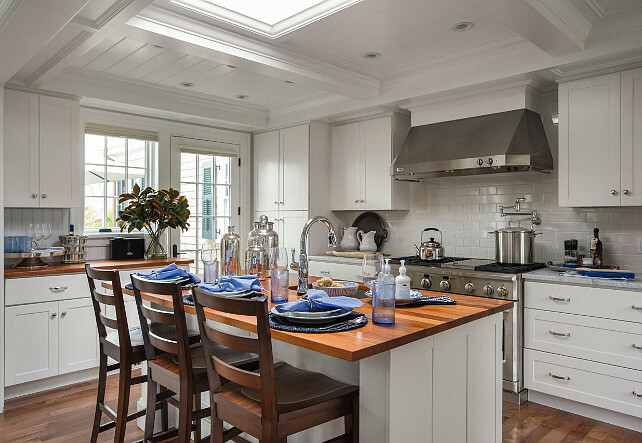 The designer mixed simple white marble with butcher block countertops to bring interest to this kitchen. 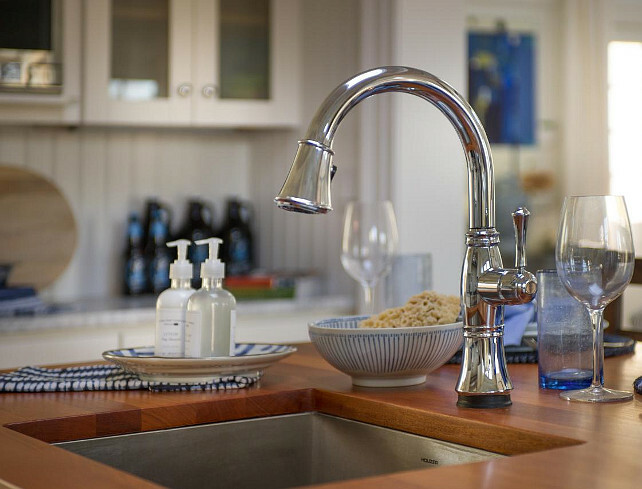 A classic chrome faucet features a single pull-down handle as well as modern touch technology that makes it easy to run the faucet even when hands are full. 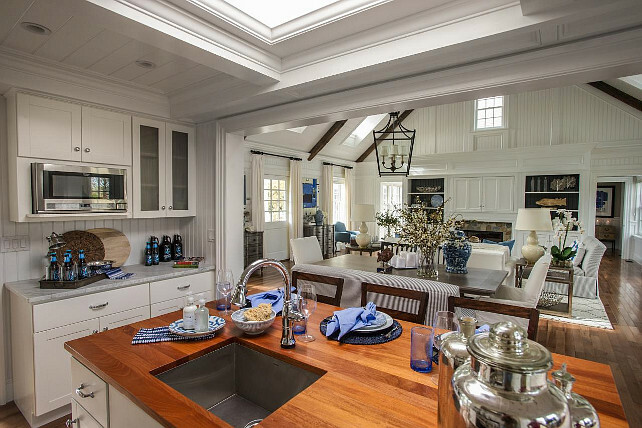 A large skylight was added above the island instead of pendants. Counterstools are the “Blair Barstool” from Ethan Allen _ $339.00/each. 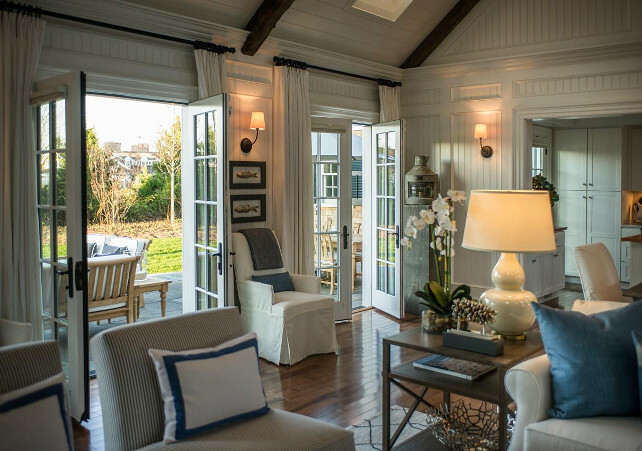 French doors leads you to the backyard. 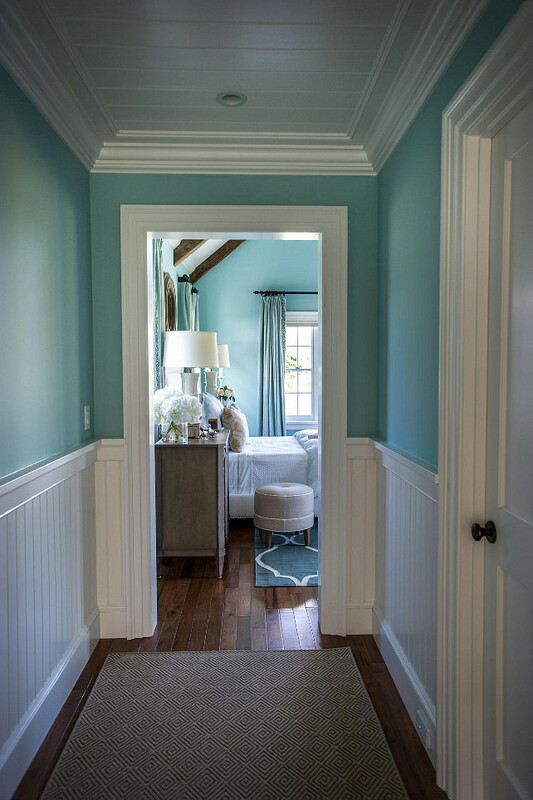 A long hallway leads you to the guest bedrooms. 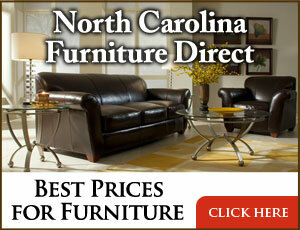 The “Barrow Sofa Table” and the “Lia Table Lamp” are both from Ethan Allen. 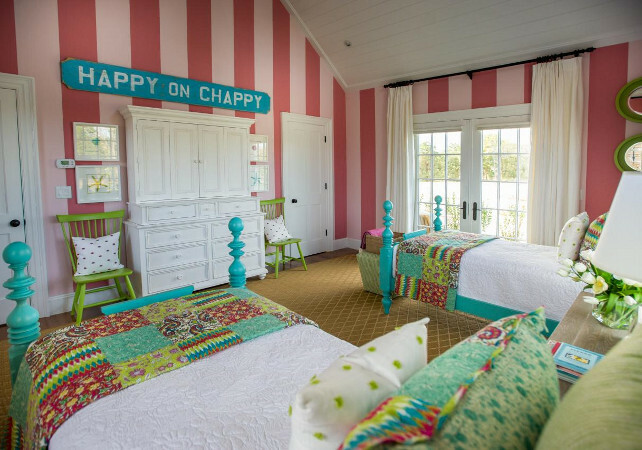 This bedroom is full of personality and fun! 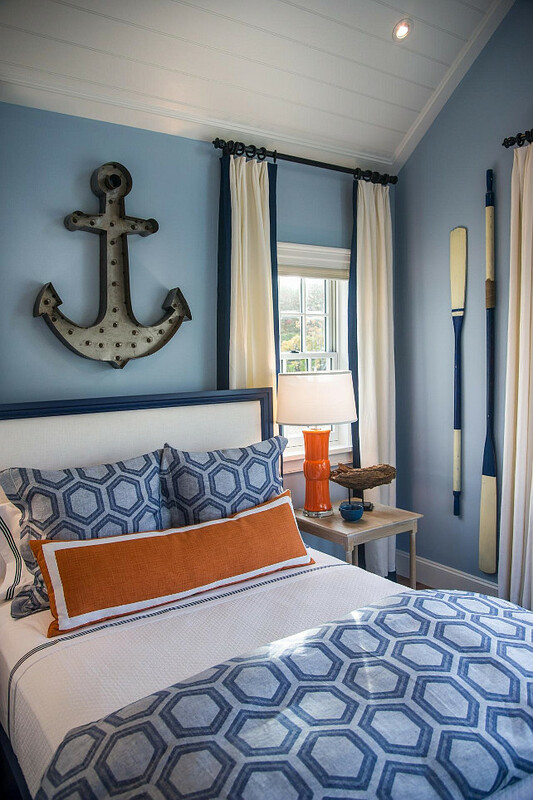 It displays a classic nautical theme with a modern twist. 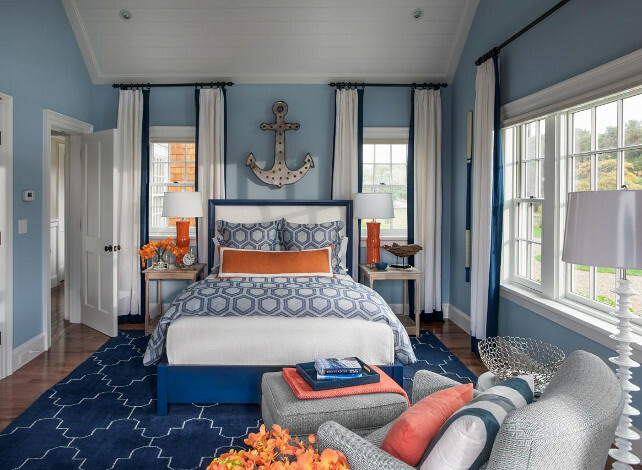 Blue and orange hues, as well as geometric shapes, are repeated in the wool rug and bedding, while vaulted bead board ceilings and floor-to-ceiling drapery expand the space for an open and airy feel. Bed is the Fairmont Bed, Marine Blue/White from Ethan Allen. Rug is the Tulu Tracery Rug, Blue/Natural from Ethan Allen. Bedding is the “Geometric Linen Duvet Cover, Navy” from Ethan Allen. 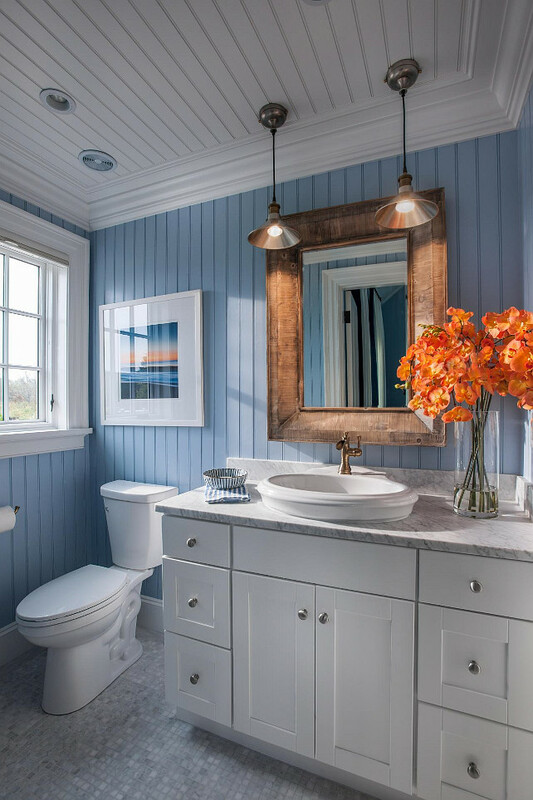 Blue bead board walls bring New England charm into this bathroom, while a Carrara marble vanity top and accent pieces add a touch of elegance. 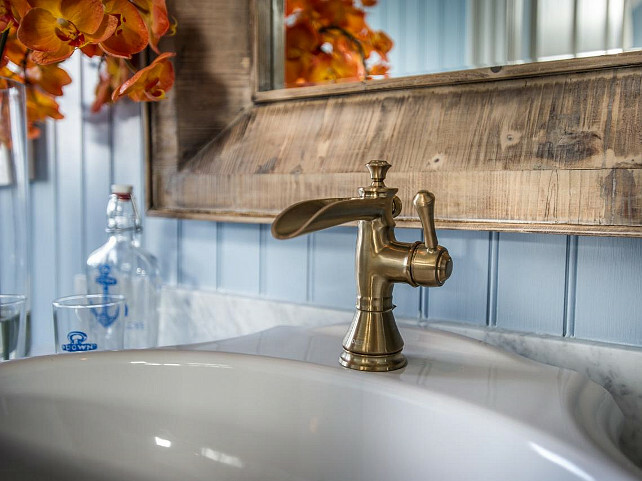 Beautiful channel spout faucet in a bronze finish. Crisp white hues displayed in the vanity cabinetry and above the sink transition through the glass shower door into classic subway tiles. 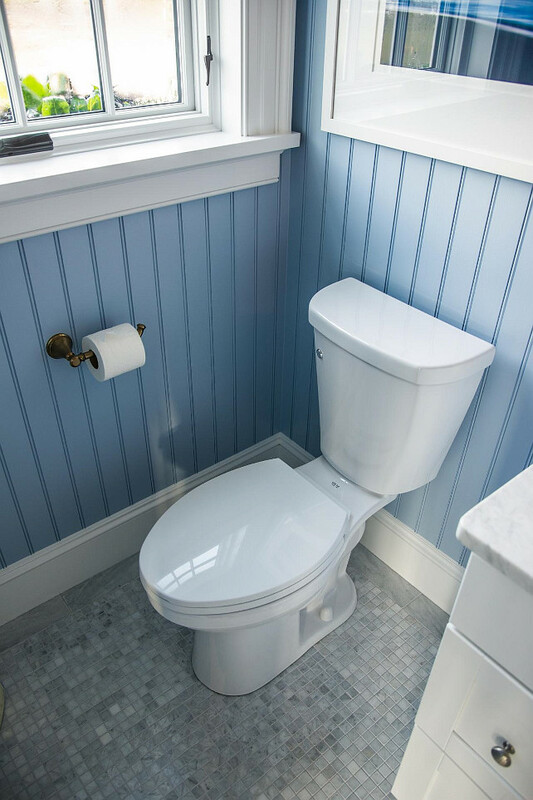 Say goodbye to germs with a simple wave of the hand over a touch-free, flush toilet. Genius! The paint color in this kids bedroom is “Sherwin Williams SW 6311 Memorable Rose” and “Sherwin Williams SW 6309 Charming Pink”. 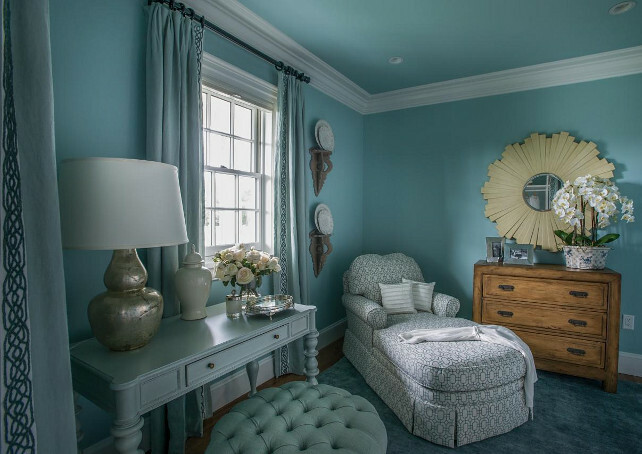 Beds are the ” Quincy Bed, Turquoise” from Ethan Allen. 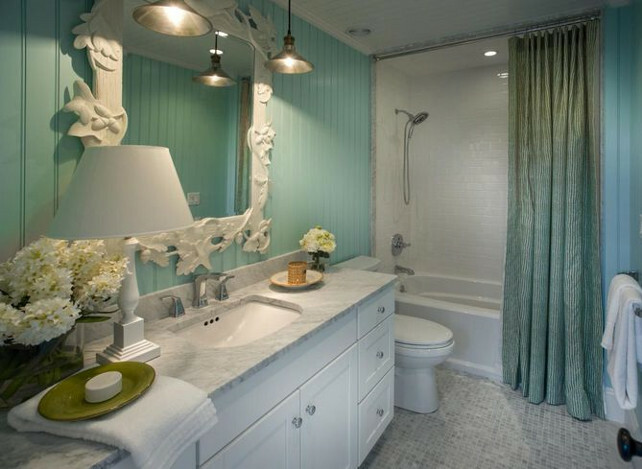 It’s easy to fall in love with this bathroom! 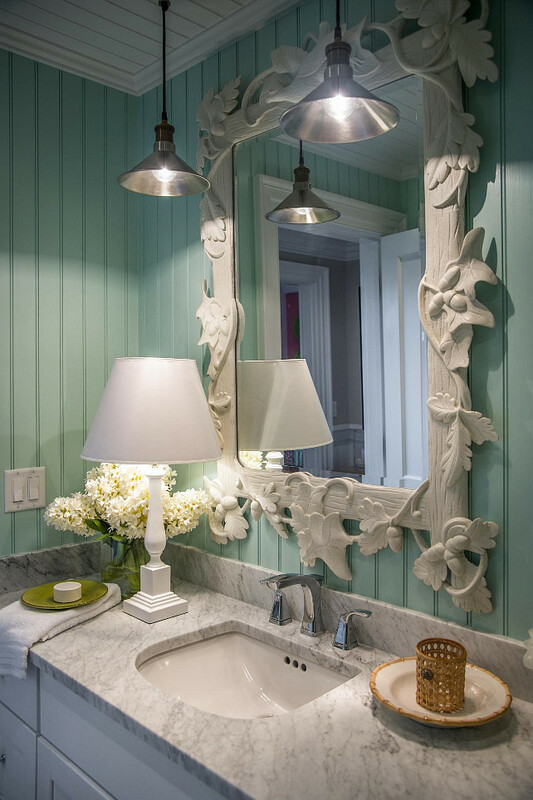 The nature-inspired style of this decorative mirror offers a whimsical statement piece that pops against pastel beadboard walls. 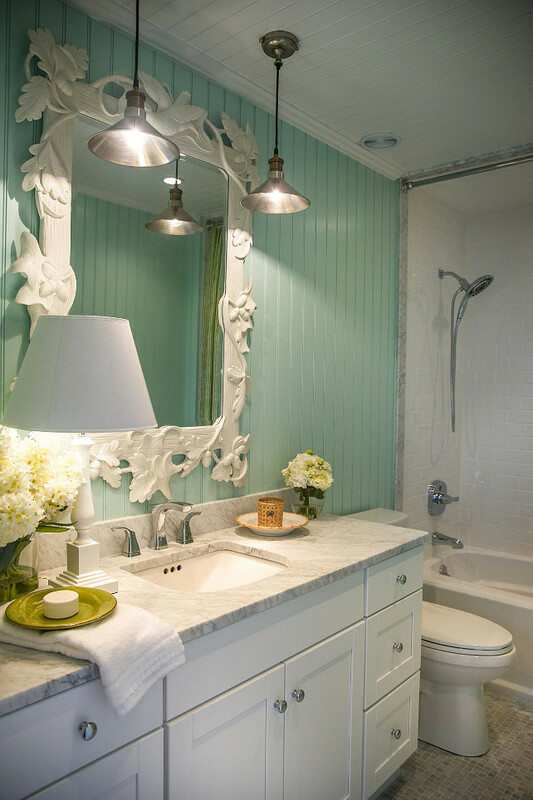 Hanging pendant lights and a table lamp radiate a soft glow and set the mood for evening bath time. 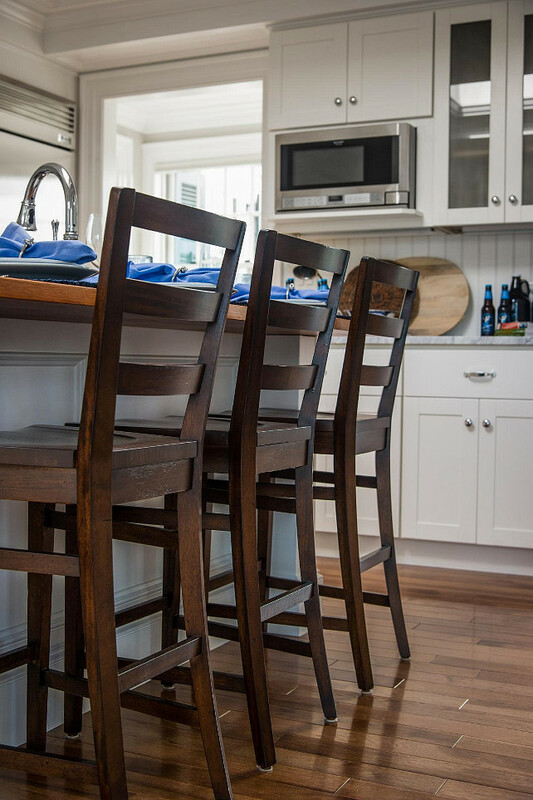 Notice the butcher block countertop. 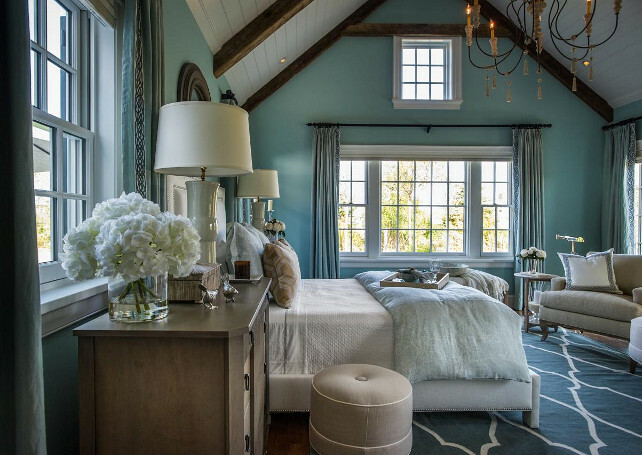 This stunning master bedroom combines neutrals with calming shades of blue as a nod to the soft coastal style found in the Cape Cod home. 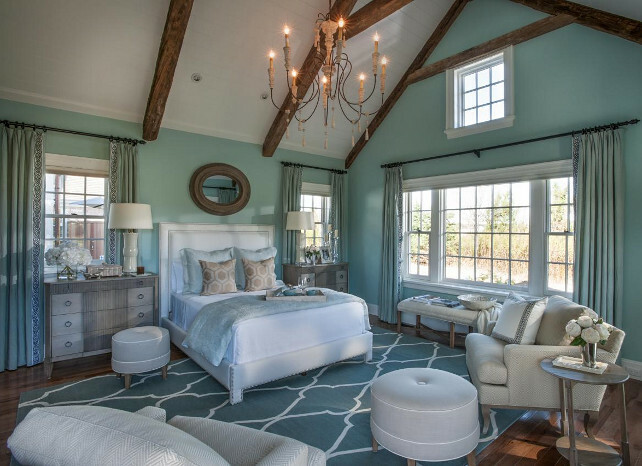 The queen bed combines white with soft blue for a gentle calming effect. The upholstered headboard with a nail-head trim is a luxurious addition that frames the bed and exudes a soft, cozy vibe. Rug is the Fretwork Dhurrie Rug, Seafoam from Ethan Allen. 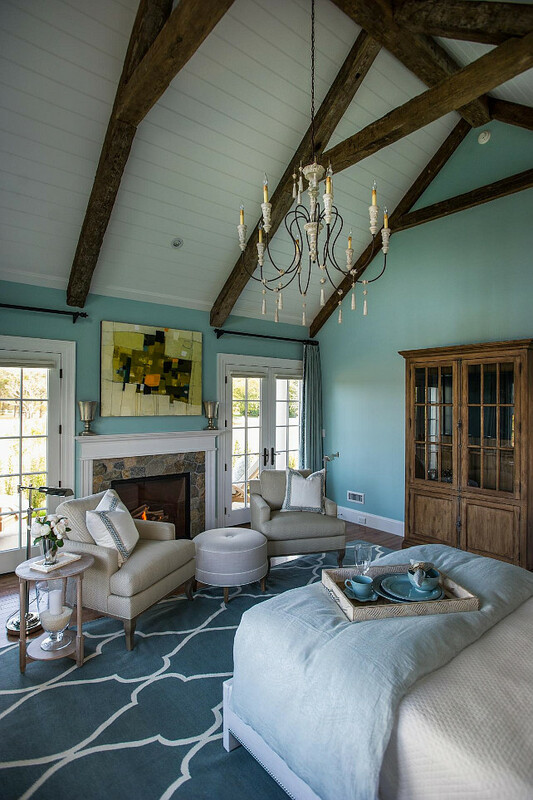 Large windows and French doors flood the master bedroom in natural light and offer sensational views of the breathtaking landscape surrounding this home. 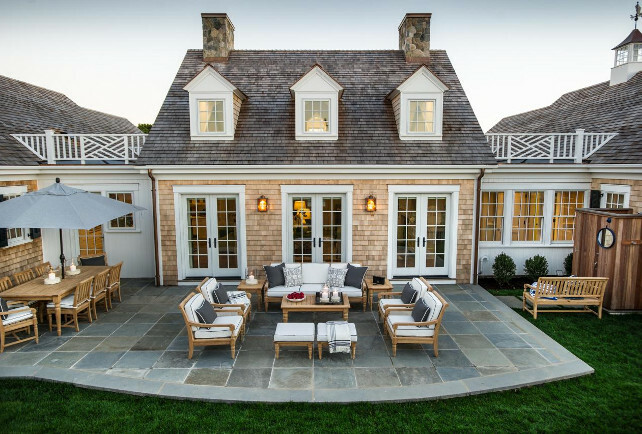 This private patio is truly a quiet retreat. 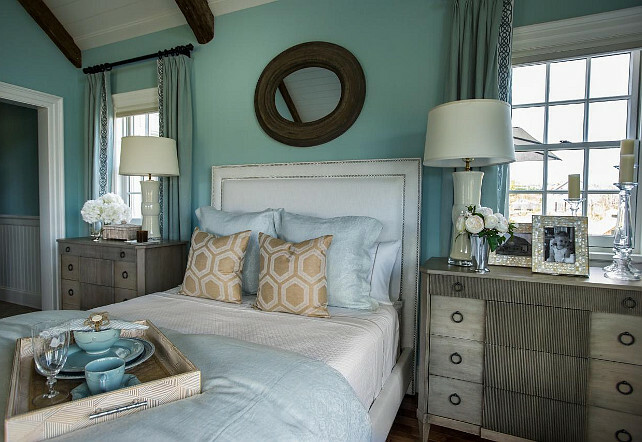 The queen bed combines white with soft blue for a gentle calming effect. 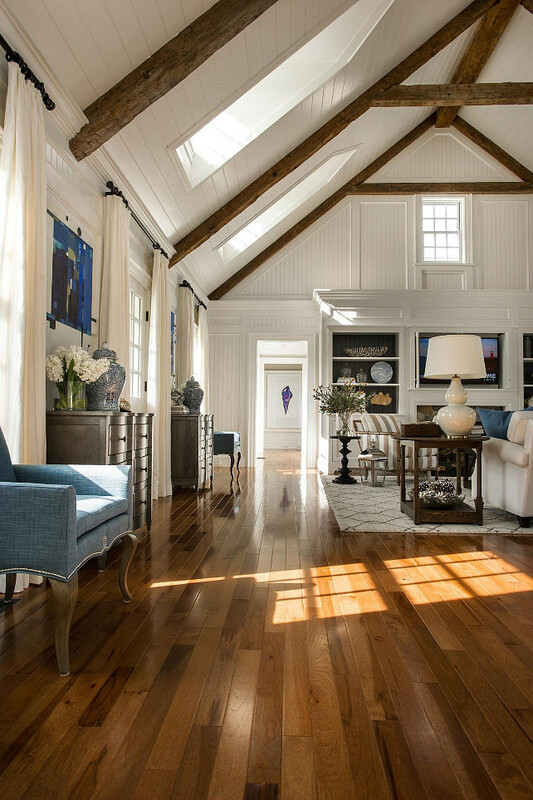 The master bedroom suite takes up the entire right wing of the house and includes the master bedroom, master bathroom and a spacious master closet. 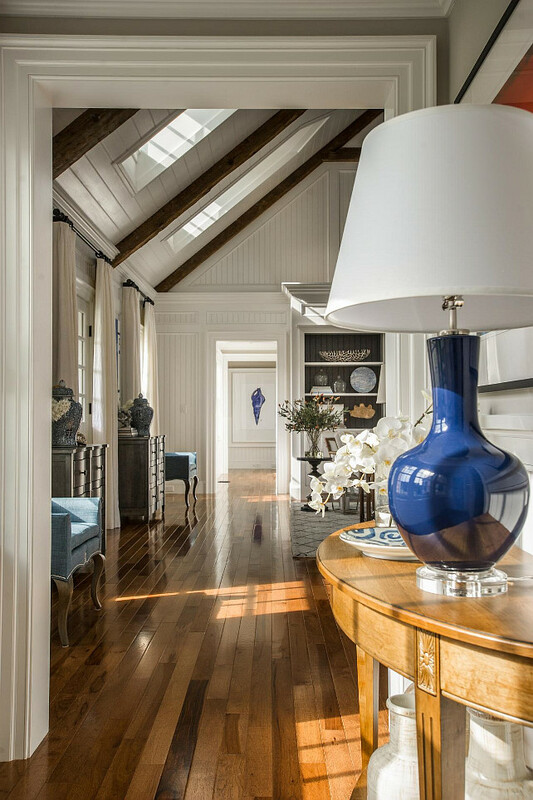 Each area is painted in a gorgeous blue that separates the suite from the rest of the home, making it a beautiful, calming escape. 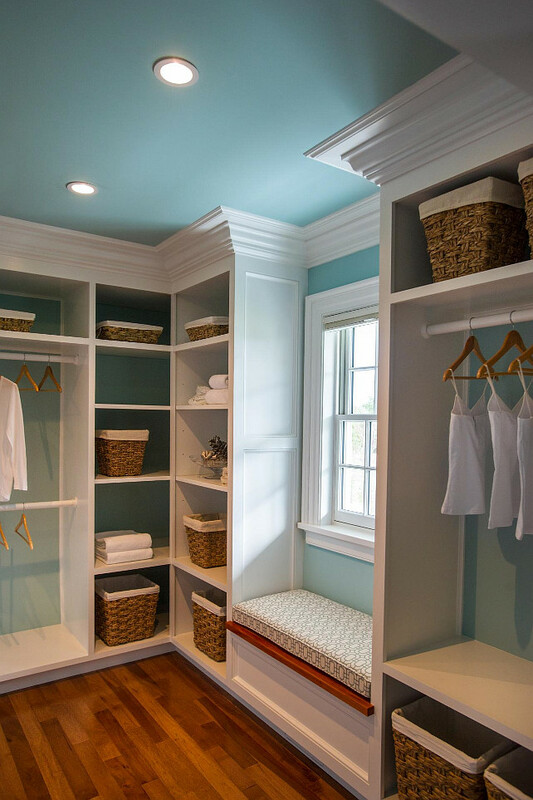 A separate dressing room is any girl’s dream. 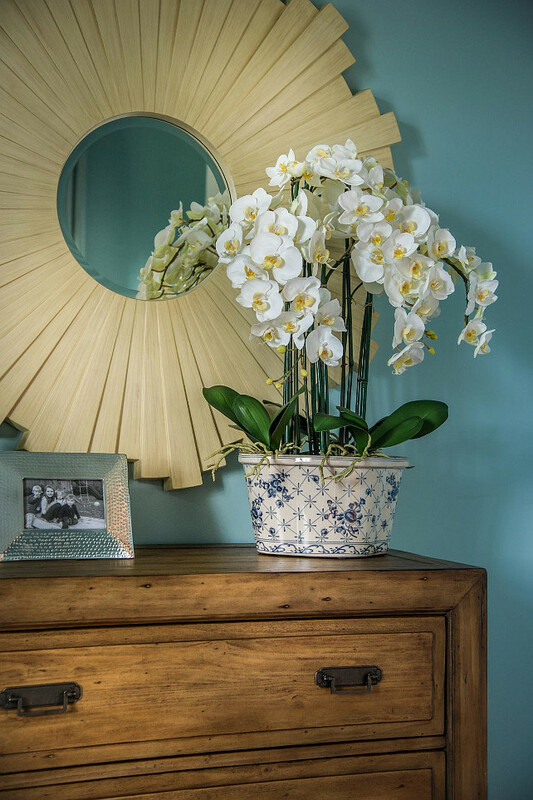 A rosette mirror complements the blue walls, emphasizes warmth from the wooden chest and highlights yellow accents in the floral arrangement. 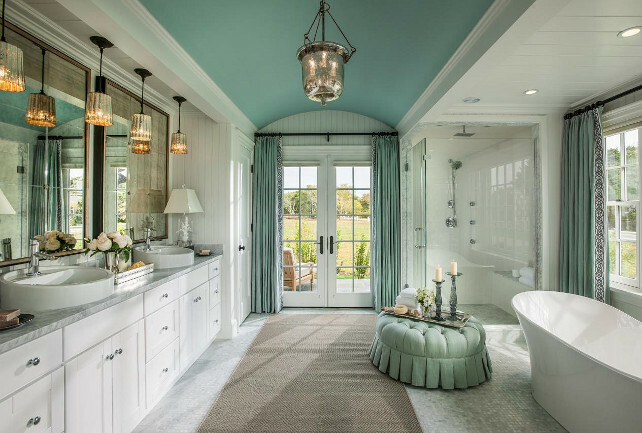 Stunning tile work, soft fabrics and a calming color palette blend perfectly to form an inviting space designed for relaxation. 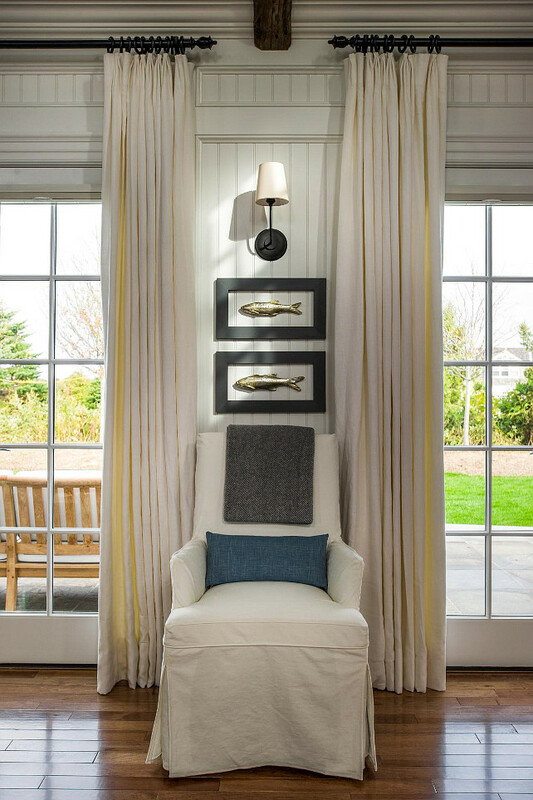 Lighting is from “Ethan Allen”. 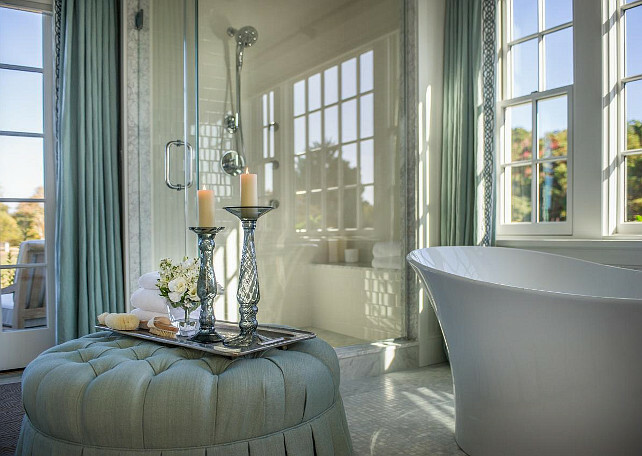 The window behind the tub features remote-controlled blinds, and the lovely blue curtains match the curtains in the master bedroom. 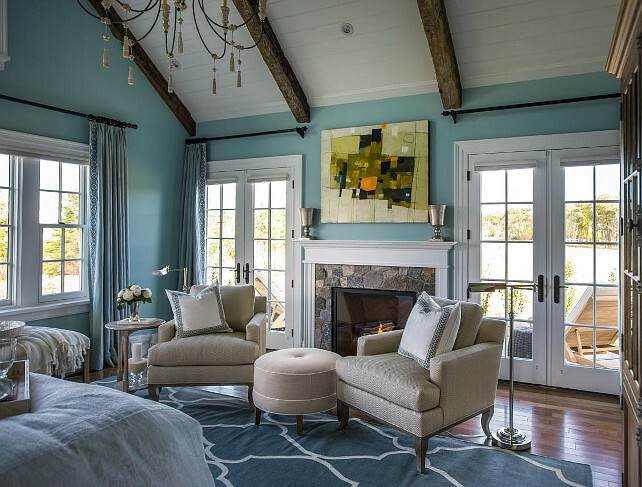 Ceiling Paint Color: Sherwin Williams 6478 Watery. Trim: Sherwin Williams Pure White. 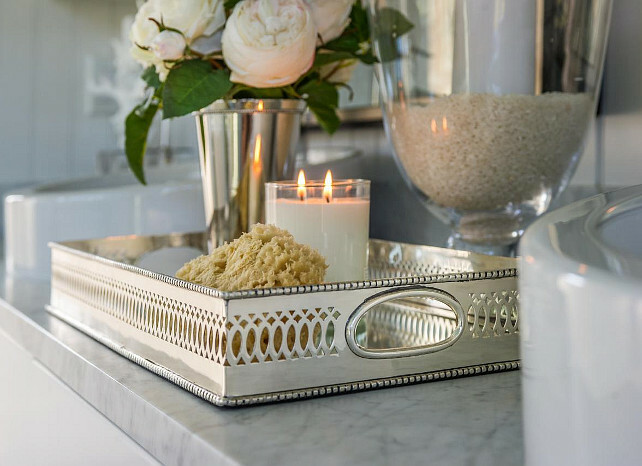 Bathroom counter decor… just beautiful! 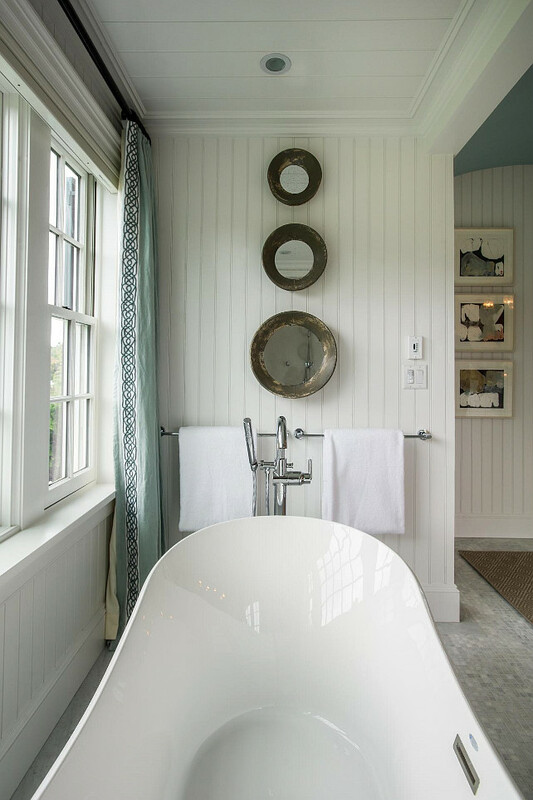 To reflect light and add depth to the room, a trio of mirrors descends from the ceiling to the towel rod. 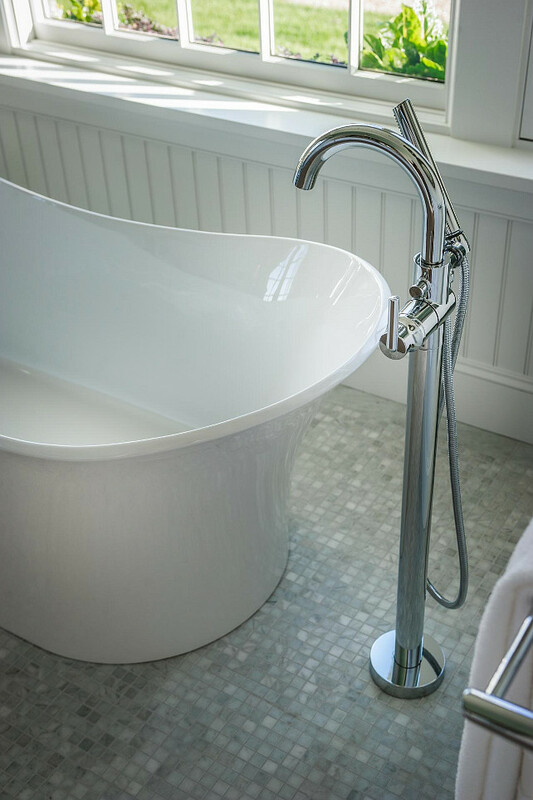 A free-standing tub sits on eye-catching mosaic Carrera marble flooring. 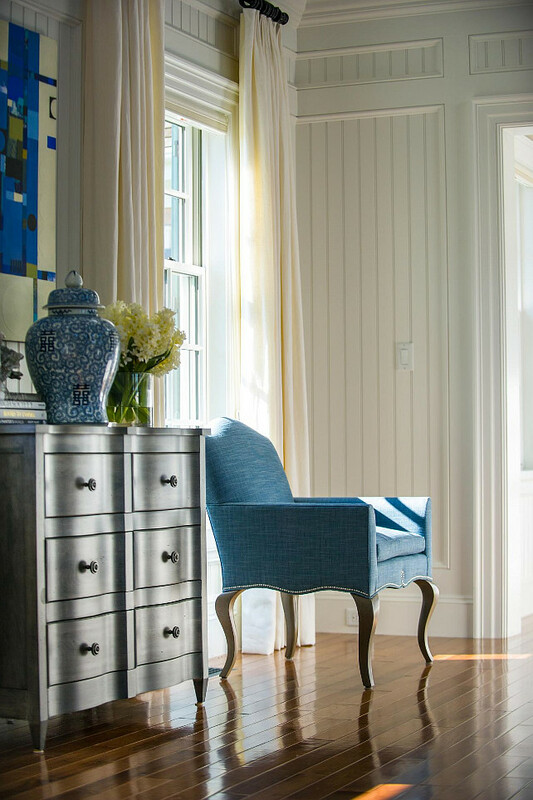 Ottoman is the “Coco Ottoman, Cayman/Sky” by Ethan Allen. 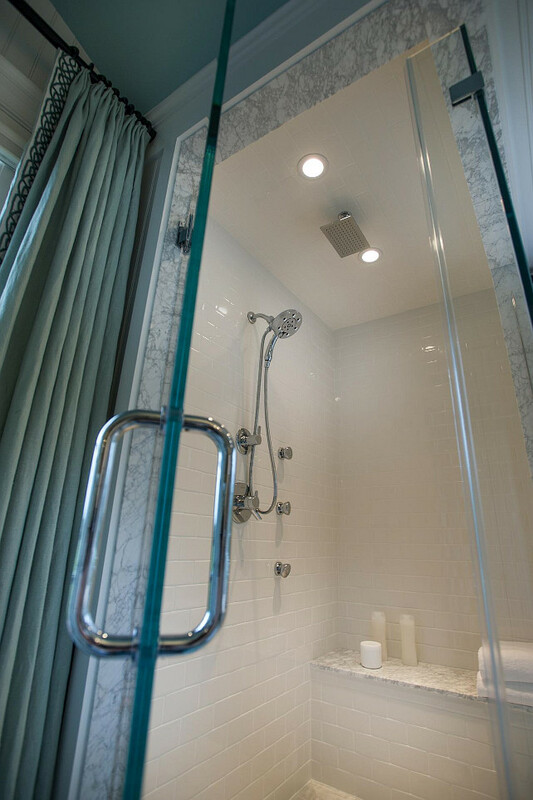 The sleek glass shower is completely lined in white subway tile and features a convenient seat, recessed lighting, and both a wall-mounted and overhead showerhead. 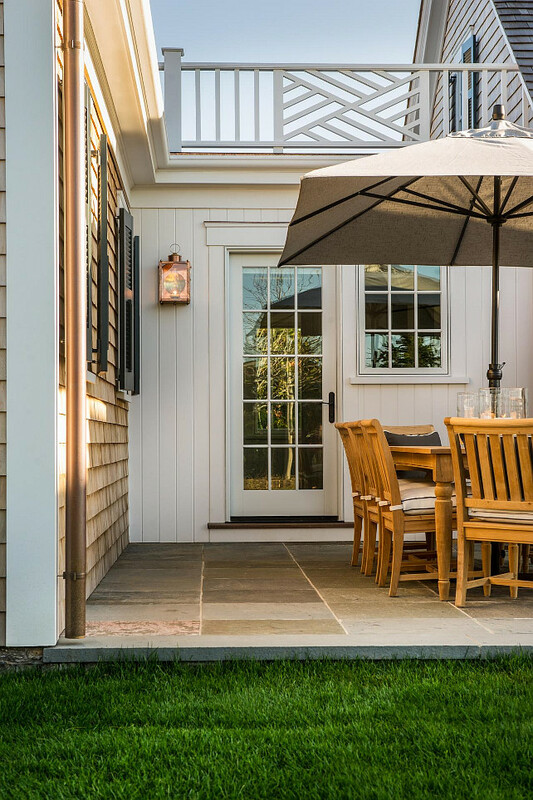 The backyard offers a place for dining and a comfortable place to sit and relax. 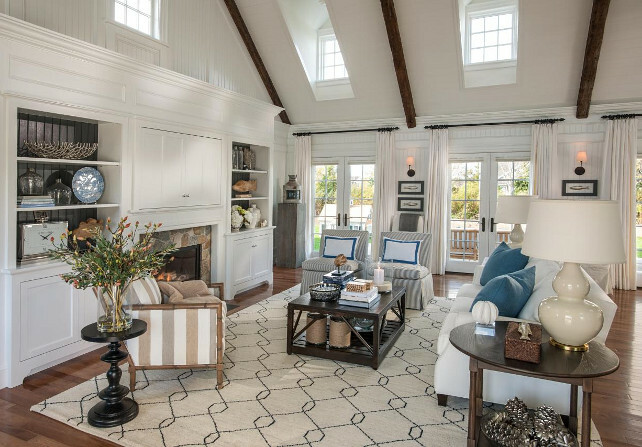 Plenty of seating makes this the perfect spot for entertaining. Large stone tiles give the back patio a classic look that easily hides dirt and makes cleaning a breeze. The back patio is just off the kitchen, making it easy to prepare meals indoors and transfer everything to the table outside. 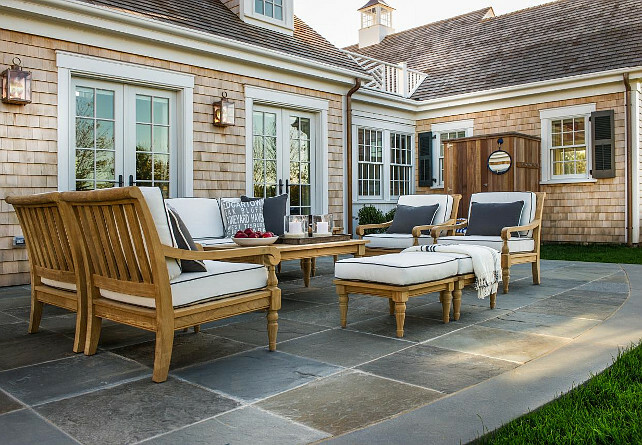 The teak furniture and white cushions echo the home’s neutral colors. 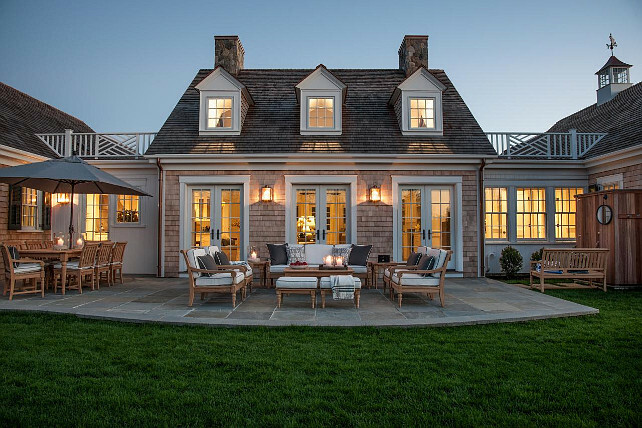 Wouldn’t it be nice to spend your summer nights here? I hope we all can have a healthy (please, God! 🙂 ) and Blessed week! 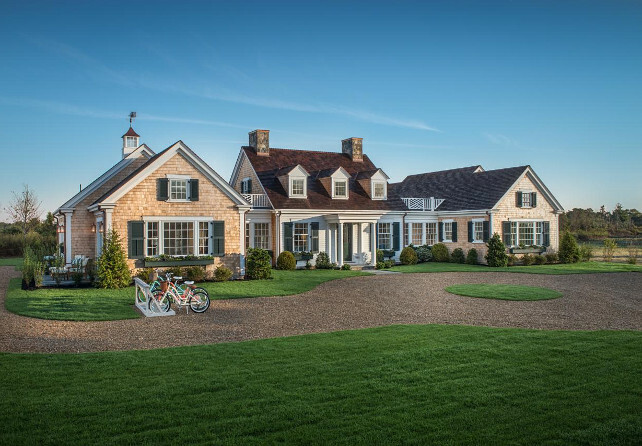 Sources: Surroundings, HGTV 2015 Dream House, Ethan Allen. 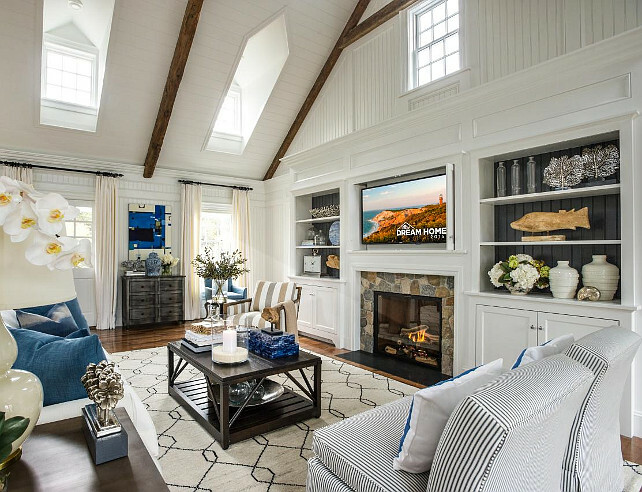 WOW what a stunning and beautiful home…so inviting and warm and cozy. I just love it! The perfect family home…..so happy you are not allergic to your puppy but sure hope you are on the mend soon! I am so glad you found out why you haven’t been feeling well; sometimes that is half the battle. And it is great news that you are not allergic to the puppy! Beautiful home, thank you for showing it to us. Hope you feel much better very soon. I certainly hope you’ll be feeling better soon! You’re right… Moms don’t have time to get sick! 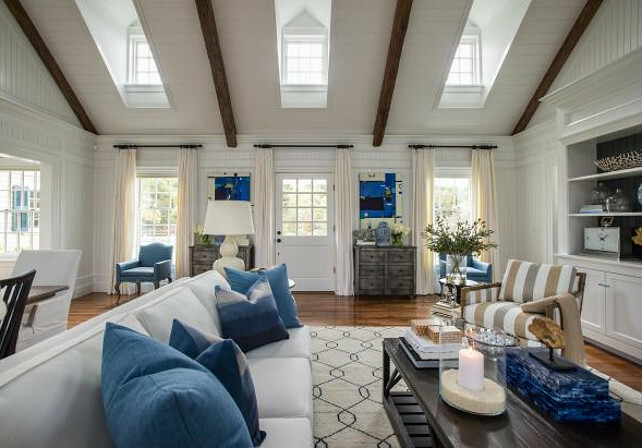 Thank you for researching more details on this beautiful home. 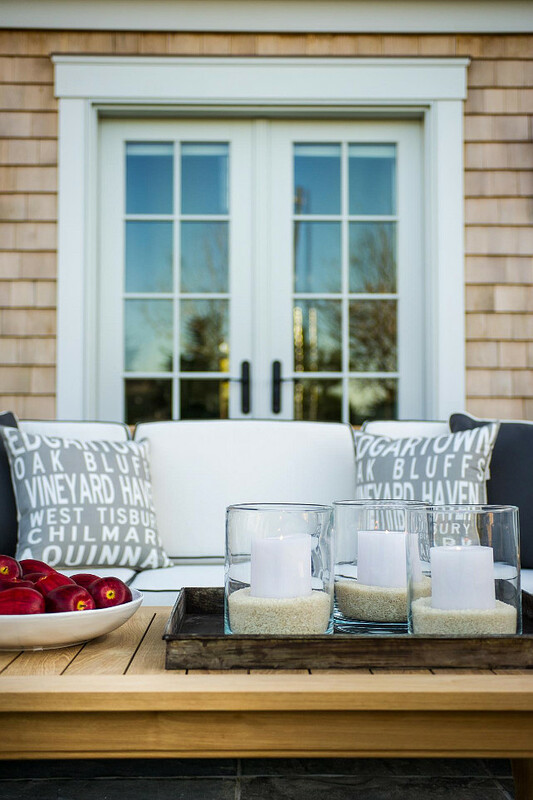 I love it, too, and I’m pinning lots of these ideas for my new house! 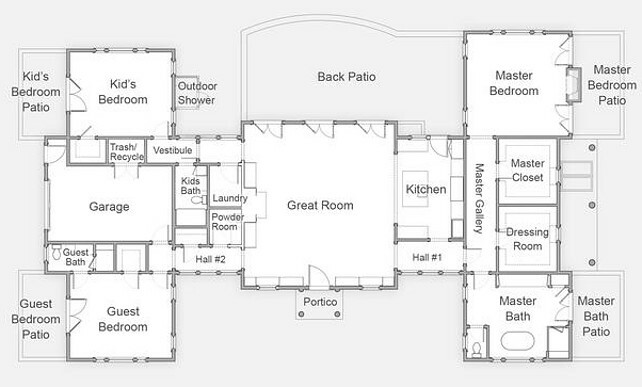 No doubt it’s a beautiful home and I don’t know the square footage but the master wing seems like a huge waste of space in a house with no family room and only 3 bedrooms. I should have the problem of remodeling it. What is the color used in the Boy’s bedroo? I don’t have this information. Please contact the architect, Patrick Ahearn, for more details. 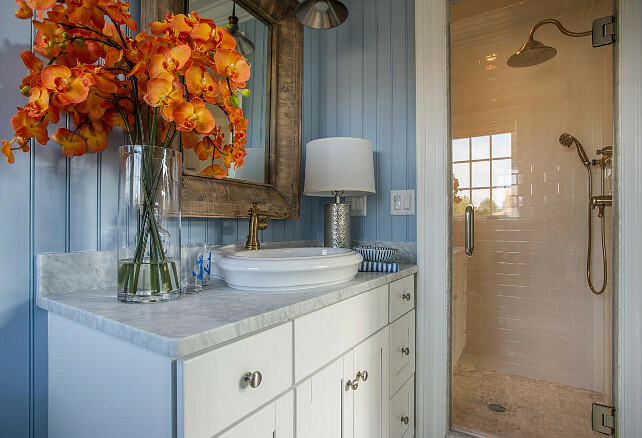 Can anyone tell me the color of the blue beadboard bathroom? All the other rooms note the color used besides this one. 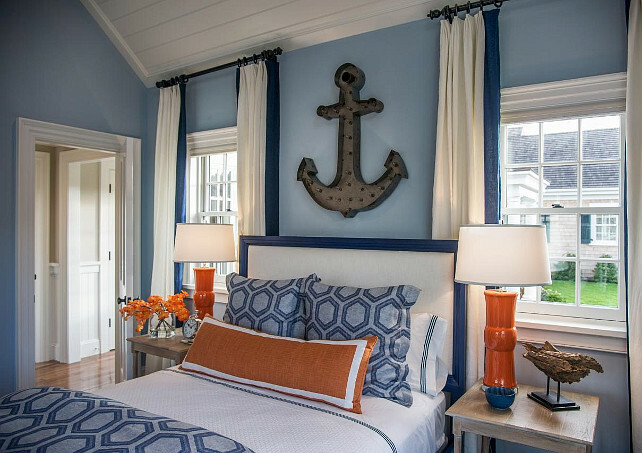 Paint color is Sherwin Williams SW 6520 Honest Blue.